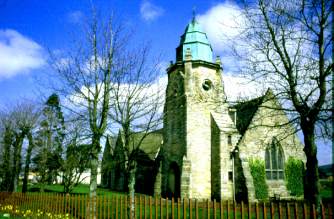 Drumclog Church is located by the side of the A71, west of Strathaven. The old memorial stone is located between the church and the road. Drumclog Curch was erected in 1912. 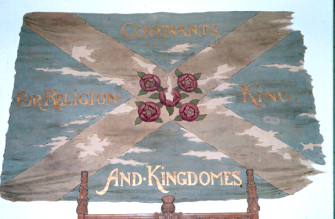 Painted on the wall inside the church is a representation of a Covenanter flag. 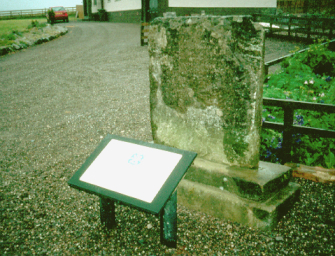 Within the kirkyard, between the church building and the road, is a fragment of the original Drumclog Battlefield Memorial. This had been erected in 1839 but was struck by lightning a few years later. Fragments of the stone were built into a wall at Brownside farm (NS 656421), but in 1998 this part of the memorial was placed in the car park at Baxter's Country Inn, Ryelandside. It was later relocated to this place.